I don’t mention the front garden much, mainly because I don’t give it much attention. I go through brief periods of spending time on it in between longer periods of just staying in the back. That doesn’t mean it’s neglected though. 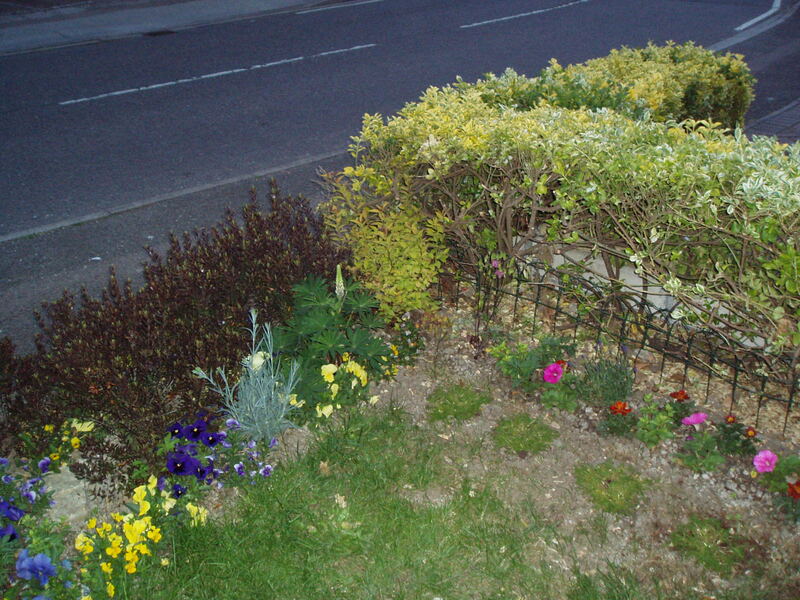 I managed to find three photos of the front garden taken in different years that show how it has changed from when I took my first tentative steps in gardening through to now-a-days where as my confidence has increased, so have the plants and the borders. In 2009, when I first started on the front, it did look a mess. In went bedding annuals of pansies and impatiens and everything was small, delicate and fussy. The other larger plants such as the dianthus, lupins and hebe (or their descendants) are still there, but the annuals have long since gone. In 2010, I must have spent a considerable amount of time and money on lawn care, as it has never looked so good. Now, it’s full of weeds and moss, which is one of the main reasons it’s gradually being replaced with borders. In this second year, the annuals have gone, the herbaceous perennials have grown, the borders have expanded and the plants are larger. No more fussy beddings plants. 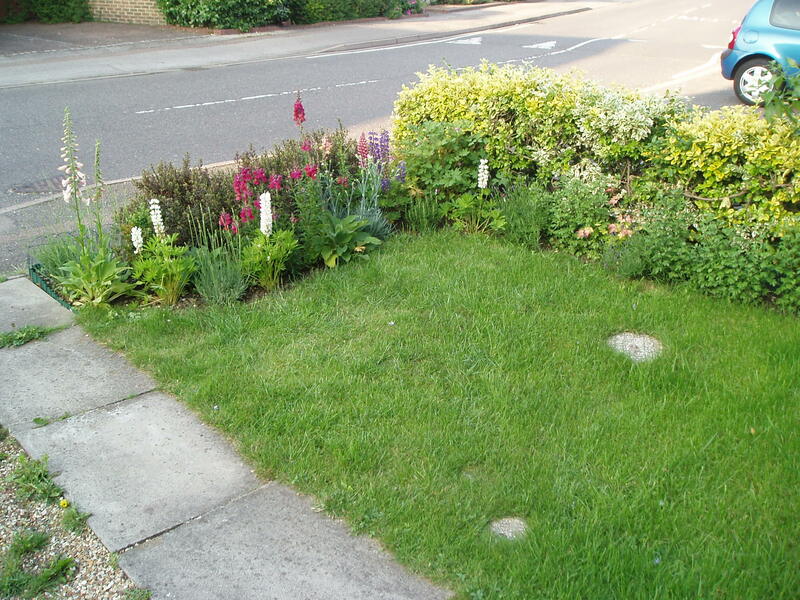 This photo of the front garden in late 2011 shows a great increase in the borders, plants and just general growth of everything. The row of sunflowers are the backdrop to lavender, snapdragon, lupins and dianthus with the hebe edging the pavement. Meanwhile, the border along the hedge has been brought out and now has hollyhock, hosta, fuschia (from cuttings) and a sarcococca hidden under there somewhere. There are also lots of other plants and several such as aquilegia and physalis were raised from seed that year. 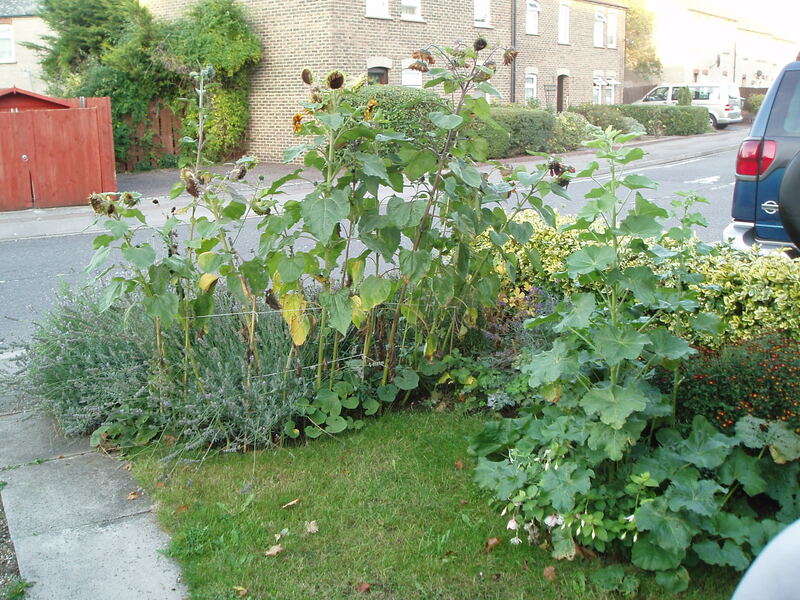 These series of pictures of the first three years of the front garden also show how I’ve developed as a gardener and from learning and experience, become more confident and aware of the plants I want to and can grow. It has taken me three years to get this far and although that seems like a long time just to move onto bigger plants and borders, gardening is something that you do, at your own pace, over a lifetime and from that point of view, I’ve barely gotten started.